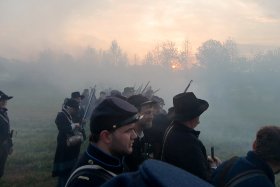 HOME « The Turner Brigade--Missouri Volunteers, U.S.
Turners fight on the retreat to Leasburg, MO, 2011. Civil War reenacting is an exciting and rewarding hobby. The Turner Brigade is a reenactor organization that portrays infantry, artillery, cavalry, and engineer units of Missouri Union volunteers and civilians of the Civil War period. 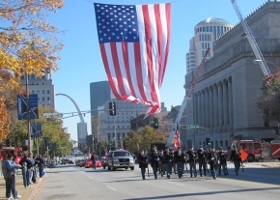 We are a family-oriented group, with members from all around the St. Louis metropolitan area and beyond. Our group is affiliated with and active in the Missouri Civil War Reenactors Association, the regional reenactors’ group. For national events, all of our military units are affiliated with the Frontier Brigade, 1st Federal Division. Members of the Turner Brigade form at Spring Drill at the Battle of Pilot Knob State Historic Site In Pilot Knob, MO, in April 2018. 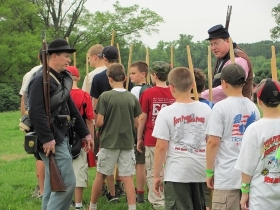 We participate in battle reenactments and living history events throughout Missouri and in adjoining states. We also participate in other kinds of events, such as memorial services, parades, Boy Scout camporees, and band concerts performing the 1812 Overture. Our commissioned and non-commissioned officers have many years’ experience in the hobby and will work with you in getting started. Our multiple units permit our members to learn and experience several period military disciplines.If you have seen Civil War reenactments and thought about participating, or if you are a student of Civil War history and wish you could relive some of it yourself and share it better with others, then contact:Patti House or Scott House, Membership Committee.